If your home has more than one floor, then it’s extremely important to ensure that your indoor stairways have adequate lighting. You and your family need to be able to see as you traverse the stairs, and not enough light or too much light can greatly impact how the space feels and functions. Safety is always a priority when it comes to stairways, but it’s also important to consider the aesthetic of your stairway lighting. At Hortons, we can help you find the best fixtures for these unique spaces! How many times have you told your kids to be careful on the stairs or not to run up and down them? You don’t want anyone to trip and fall down the stairs, and you don’t want the steps or the railing to be damaged by rambunctious children. However, one of the most important safety aspects of any stairway is its lighting. It’s necessary for you to be able to see as you make your way up or down, and adequate light over the stairs makes it easier for you to find each step. A dark or dim stairway can cause you to trip on a loose piece of carpet or catch your toe on the next step up. One way to improve your stairway lighting is to make sure there are controls at both the top and the bottom. You should be able to turn on the lights before you make your way up, and then switch them off once you’re at the top. If there’s only a single switch that controls the lights, come to Hortons and we’ll help you find the right options. While you want your stairway to be safe and functional, that doesn’t mean it has to be drab when it comes to decoration. 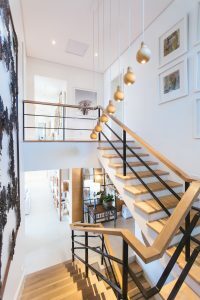 If the stairs lead from the entryway on the first floor to the hallway on the second floor, and the ceiling extends to the second floor, then you may have enough room to hang a small chandelier (or a large one, given the space’s dimensions). This fixture will provide the ambient light you need, and when paired with wall sconces that run the length of the stairway, the space will be transformed. Speaking of wall sconces, make sure yours are installed high enough so that a person of average height can’t see into them when walking up the stairs. If you need help with fixture selection or need installation tips, visit us today! At Hortons, we want every area of your home to be properly illuminated, including your stairways. If you’ve been thinking about adding new fixtures along the stairs, or you need new switches so that it’s easier to control your lights, visit one of our locations today. We have stores in La Grange, Chicago, and Orland Park, so chances are there’s one that’s not too far from your house! If you have questions before you stop by, you can always call us at (708) 352-2110 in La Grange, (312) 337-9172 in Chicago, and at (708) 403-9172 in Orland Park. You can also fill out the form below, and a member of our team will respond as soon as possible.